Are you fascinated by edible containers? I am not sure why, but I am enchanted by them! So you can imagine my excitement when I recently saw the Magic Pop Korean style rice cakes. They are made of wheat, brown rice and corn. These crispy cakes are almost as big as the tea cup saucers! Plus the package said fat free, low calorie. 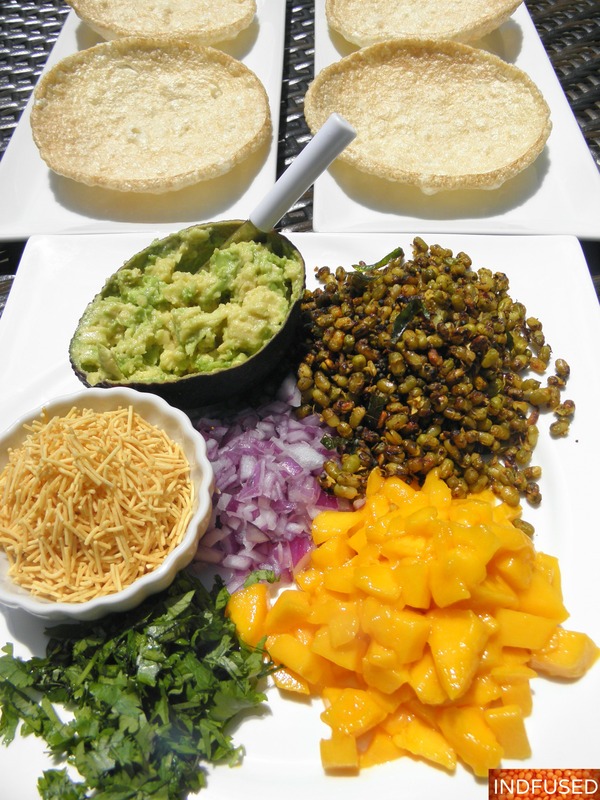 I immediately started thinking what I would top or rather fill them with….something healthy and yummy …so why not have a tostada bar- Indian style! Heat the oil, on medium heat. Add the mustard seeds, asafetida and the curry leaves. When the mustard seeds start to splutter, add the grated ginger and stir for a few seconds. Lower the heat, add the sprouted mung beans, the sea salt, turmeric and chili powders and slow roast the mung beans for about 4 to 5 minutes or until crispy. Add the lime juice, stir for another 30 seconds and remove from heat. 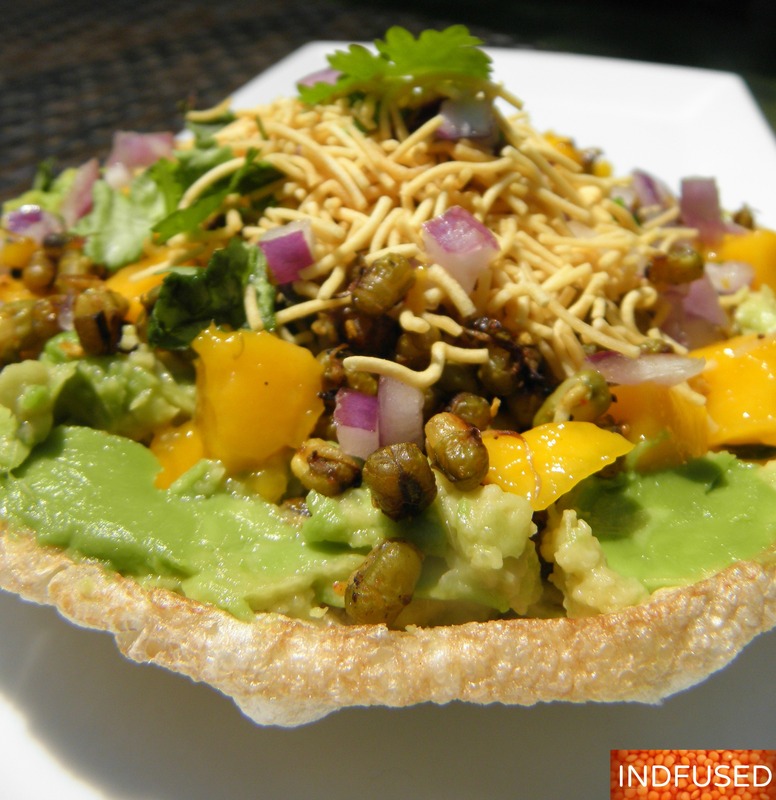 On the Magic Pop cracker, spread the mashed avocado, top with mung beans, mango, onion, cilantro and the sev! Enjoy! What drink would you serve with these? I like a Pina colada with mine. Have a great weekend everyone! Love your creation here…mung sprouts will add a great texture. Will try it. Oooooooooo…….. So like sev puri. All kinds of goodies piled on to a crunchy base. Lovely! How creative is that! Fabulous use of magic pop ups! I love those magic pops! They come in different flavors too. I found the plain ones. I should look for ohter flavors now! Thanks Robin! I hope you have a great week too! I love these, what a fabulous idea. Just think, no washing up. Your filling sounds so good too. These are lovely Sandhya – I just wanna bite into one now. What a fun idea for parties! 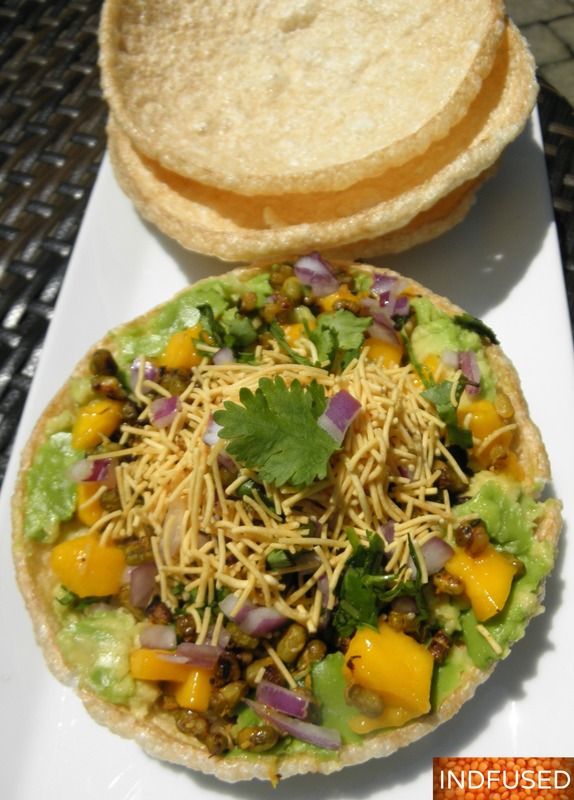 The Korean tostada shells look really interesting! I am loving the cross over of flavours and influences and will definitely have a go at doing something similar although I have no idea what ‘magic pop rice cakes’ are 😀 I love bringing influences from all over the place into what I eat so this strikes a real chord with me! Thanks Brian! I love cross over of flavors too.I see versions of the Magic pop rice cakes at whole foods and Asian supermarkets now. Love the concept Sandhya…next time we have a small party or family time together…this will definitely be on the menu!!! Oh wow, this looks delicious; I love the flavors you have in this dish! I’ll take a pina colada with mine also, please. I’ll head over soon for some! Thank you so much Marissa! I am a big Pina colada fan as well!